I was indifferent to my chin for nearly two and a half decades. As I neared my thirties, however, I started to notice some displeasing qualities. In pictures of my profile, I’m particularly uneasy with the convex nature of my jawline and if I am not careful how I hold my head, a picture from the front can reveal a double chin! I’ve adopted a series of strategies over the years. Little Sagan Charles arrived early and weighed only 4 pounds 13 ounces when he was born. Like a lot of babies, he lost weight his first week and was staving off some jaundice. His first pediatrician visit, he was down to 4 pounds 5 ounces and in the “< 3” percentile for his weight. Suddenly my number one goal was to get the little guy to gain some weight. Every two hours, we fed and pumped. Fed and pumped, fed and pumped, fed and pumped. His bilirubin score no longer became a concern. He put on 7 ounces in one weekend, so his weight was moving in the right direction. At his one month appointment, he was projected to weigh 6 pounds 8 ounces, but he came in at 7 pounds 11 ounces, moving him up to the 10% percentile. 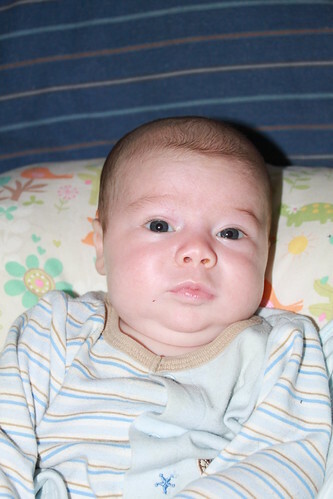 A month later, he came in at 10 pounds 12 ounces placing him solidly in the 25%. And as Sagan moved from the “< 3 %” percentile to the “25 %”, he outgrew some clothes, he got chubby thighs and chubby cheeks…. and developed the most beautiful, glorious double chin. Suddenly, the phrase “double chin” no longer had the same connotation. It’s become a source of pride, the souvenir of a job well done– over 33 gallons of pumped breastmilk (as of Dec 14th) and a son whose well pass the fifteen pound mark. Now when I think of double chins, I smile. Which is good. I need to differiate myself from Stalin in any way I can. To those of you who read my comment feed, the username Geekhiker might look familiar. He first commented on this blog in May of 2007 (on “Cell Phone…As Versatile As Duct Tape?“) and over the last four years has managed to be the top commenter. He drew the attention of other commenters. Ryan was impressed by how consistently Geekhiker could churn out a humourous comment. 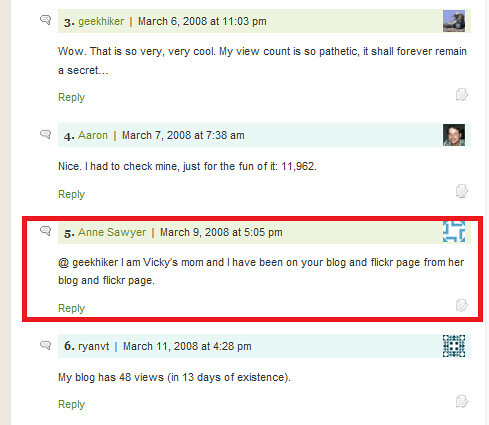 And, the very first time I saw my mother use the @username convention, was in a response to Geekhiker (on 200,000 Views). My Mother’s First @Username Comment…Sigh, They Grow Up So Fast! Well you may also have noticed a rapid decline in Geekhiker’s comments this summer. 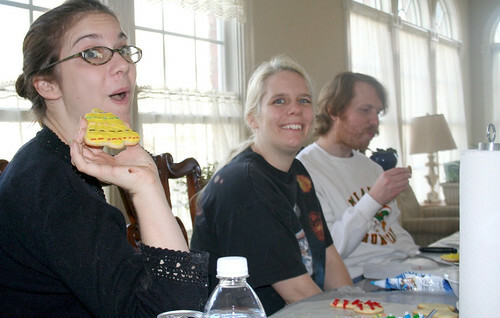 The day Sagan was born, Geekhiker also experienced a life change. This summer he embarked on an epic road trip! He’s been traveling around North America, visiting National Parks, hiking, camping and meeting some bloggers along the way. A few weeks ago, he just happened to be passing through Virginia, so we put him up a few nights! I had absolutely no idea what he looked like– I didn’t even know his real name! He, on the other hand, was a little more armed with knowledge. He instantly recognized Jimmie and Henry upon arrival! 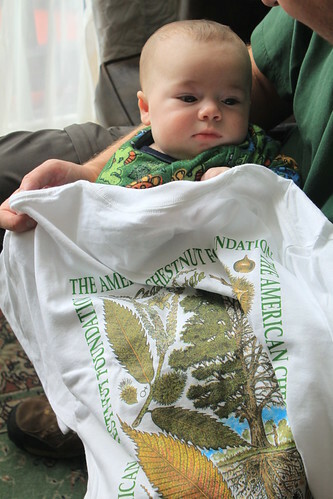 If this happened a few years ago, I most certainly would have opted to take him to the Appalachian Trail. But time is tight nowadays and the mountains (or “hills” as Geekhiker likes to call them) are farther away than I would like. So Geekhiker got to watch “diapie changes” instead. 🙂 Luckily, he is a very laid back houseguest and happy to go with the flow. Along the way, he got to go to Dixie Bones, the Garden Kitchen, Ledo Pizza and…. Taco Bell. He also got to watch me make broccoli salad for my birth class reunion. It was riveting. We did get an opportunity to hike together though! 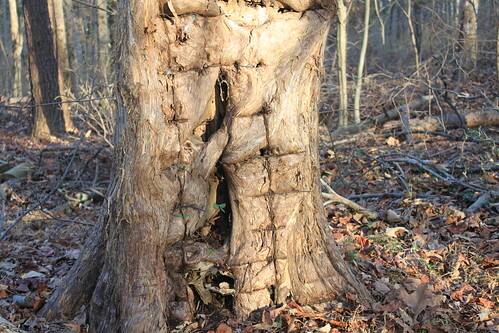 It was a short hike– between 3-4 miles at the nearby Bull Run Occoquan Trail. Henry and my Mom’s dog, Willy, were in attendance as was Ryan and little Sagan (his third post-birth hike). The section of trail we did may not have showcased Virginia as much as I would have liked, but we had great conversation and lots of fresh air. Plus Ryan and I ended up with a great souvenir! I’m usually the one taking pictures, so there are very few shots of Sagan and I together, let alone shots of Ryan, Sagan and I together. Those of you who read Geekhiker’s blog will know that he is a talented photographer. So we ended the day with some top notch photos of our little family! And for all you Geekhiker fans out there wondering what he looks like… I snagged a picture of my own! I think the thing that surprised me the most about Geekhiker in real life is his quick wit. I knew he had a smart humor from his comments and posts, but I somewhat expected he had to brainstorm and revise to get the final product. In other words, I thought he had to work for it. But as we shared meals in real life and he rattled off line after line, I realized– it all comes naturally to him! As his journey winds down, I look forward to seeing how that quick wit of his describes all his adventures.